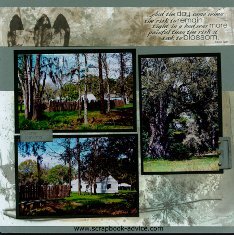 The Magnolia Plantation Scrapbook is the result of a recent trip out to the Magnolia Plantation just west of Charleston, SC. Over 100 acres of Gardens on a property that has been in the same family for 12 generations. 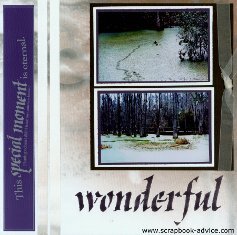 This is the inside front cover of my Magnolia Plantation Scrapbook showing a beautiful postcard I purchased at the Gift Shop which has photos of the Plantation House, a Peacock Feather and the Romantic Wooden Foot Bridge. 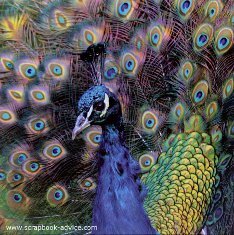 The photo under that I a peacock in full spread and it is truly stunning. 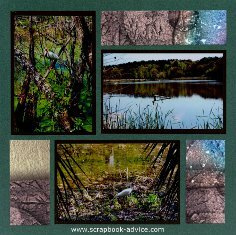 The Background paper is a Turquoise metallic with glitterd lines. The beautiful and romantic White Bridge reflecting perfectly in the black water of the plantation is symbolic of the Plantation. 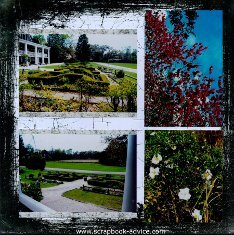 The Gardens started by Reverend John Drayton as a romantic paradise for his wife Julia. The gardens were actually opened to the public in the 1870's. The background papers for these layouts was purchased from A C Moore is called Silver Crackle. Where you see the black in the photo, is actually silver. The white on top of the Silver is distressed and cracked. I used this for the background as I thought it matched the white of the bridge and the house. I took a close up photo of the stucco on the house and used that for matting some of the photos of the house just to remember the texture. As part of the Zoo and Nature Center, are a number of the White Tail Deer, that are here as rescue animals. They are so very tame that came up to a friend of mine and were nibbling at her gift bag and continued to follow her around even though she tried to shoo them away. With over 350 varieties of Camilla Japonica in over 3500 plantings, we were at the Plantation a little late in the year so the floral photos focused on the Azaleas, Iris, Magnolia, Cherry, Wisteria, Spanish Moss and Wild Roses which were in excess all over the Plantation. 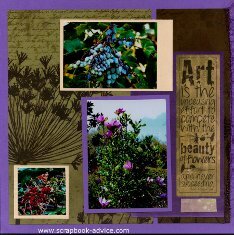 The papers for these layouts were from the Club Scrap.com that came out in May 2012 called Wild Flowers. 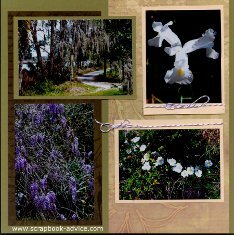 I couldn't resist putting the Iris photos on this paper with an outline of Iris'. More flowers in the naturalized Plantation garden with Red, White and Peppermint Cherry trees, George Tabor Azealas, Wisteria, Spanish Moss and Nastursium. The ribbon with the leaves came in white and was dyed using a Tim Holtz Distressd Ink Pad and Copic Markers. These adorable horses seemed to think we had something to feed them and kept trying to nudge closer and closer or maybe it was what my friend had in her little bag that was calling to them. 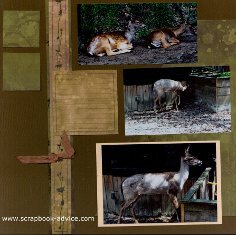 The background paper and photo mattes used here were Bling by Bazzil in 2 colors of green to match the grassy backgrounds in the photos. The dark green accents are stickers from the ClubScrap.com Kit called Natural Resources from Oct 2009. 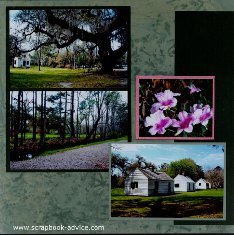 Photos of the walled garden, and slave homes on the plantation that have been kept as they were for several generations. A couple of the Grand Oak Trees and a beautiful Heron over the marshy area. Scrapbook kit items were all from the ClubScrap.com kit called Natural Resources from Oct 2009. These photos were taken from the Veranda of the house overlooking the stunning Cherry trees that were just coming in to Bloom. Papers and scrapbooking tags, ribbon and charms were all from the ClubScrap.com kit called Raku from March of 2011. 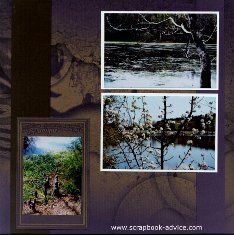 The Grand Oaks of Magnolia Plantation are the focus of these Magnolia Plantation Scrapbook. Here you can see the huge branches with the Resurrection Fern growing in the shadows. The Resurrection Fern only lasts about 3 days and comes out just after a rain. In the distance are more of the beautiful Azaleas and and op-close shot of more of the George Tabor Azaleas. Scrapbook papers and date stickers were from the ClubScrap.com kit called Natural Resources from Oct 2009. 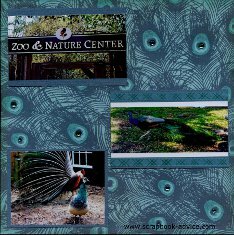 The beautiful in the Zoo & Nature Center are the focus of the next 4 pages from the Magnolia Plantation Scrapbook. 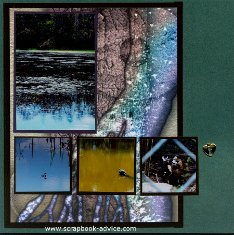 The background papers for these first 2 layouts are some Aqua Peacock papers from the "The Animal Prints Stack" from DCWV. 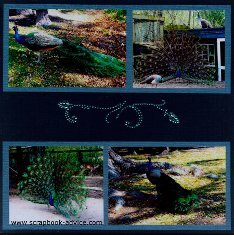 The photos have been matted with Bling by Bazill in Aqua. I have accented the eyes of the peacock feathers with Aqua rhinestones from my stash. These next 2 pages show more of the Peacocks. 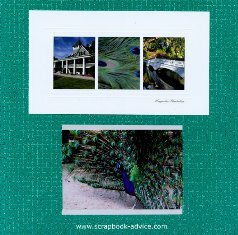 The layout on the left background paper is from ScrapYourTrip.com and is simply called Peacock. 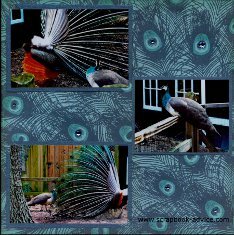 I did not want to cover it up with a photo, so I added rhinestones to several of the feathers, and to the top feathers on the peacock's head. Additionally, I used my metallic Copics, (Spica Markers) to accent the feathers with glitter. 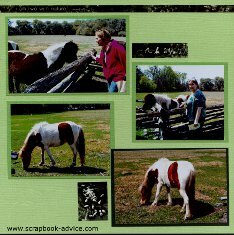 Unfortunately, none of that sparkle that I added to the page shows in these photos like they do in real life. 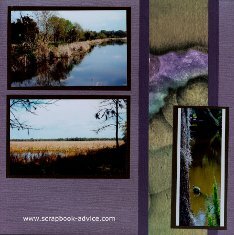 The layout on the right uses Bling Bazill paper in Navy with the Bling Aqua paper used as photo mattes. The only decoration is a turquoise rhinestone swirl that I found in my stash. 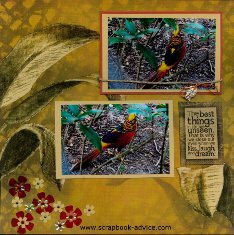 The stunning Red, Yellow, Blue and Green in these birds prompted these pages for the Magnolia Plantation Scrapbook. The papers, photo mtttes, flowers, brads, cording and charm on these layouts were all from the Tahiti monthly kit from ClubScrap.com and fit the coloring of the photos perfectly. 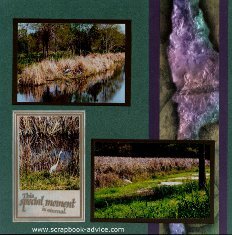 These Magnolia Plantation Scrapbook pages show the majestic Herons as they wander in the marshy Rice Fields. 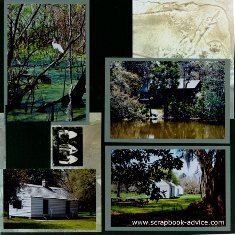 These photos were taken on a Train Tour through the Gardens of the Plantation. 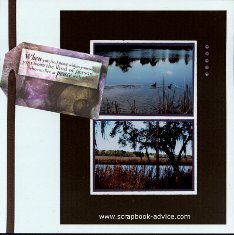 All papers, photo mattes and the journaling block were from the Raku kit from ClubScrap.com. 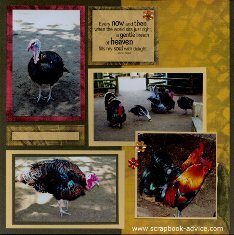 For these photo of the Turkeys and Roosters in the Zoo and Nature Center, the ClubScrap.com kit Tahiti came in handy as they reflected beautifully the reds and yellows in the photos. 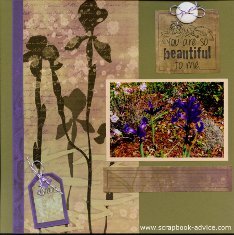 All journaling boxes and strips, ribbon flowers and brads used can from the kit. 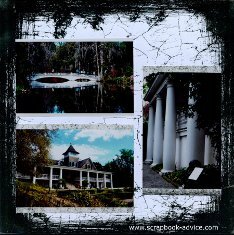 These photos taken on the Plantation tour, focus on the ever present Waterfoul and make a great addition to the Magnolia Plantation Scrapbook. 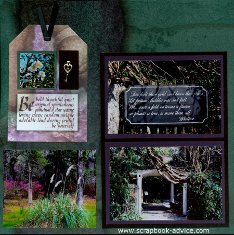 These papers, ribbons, eyelets, journal tag and journal strip were from the kit called Raku from ClubScrap.com. 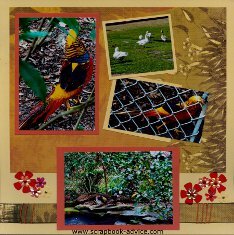 More photos of the Ducks, Herons, and Birds spotted in the Gardens for the Magnolia Plantation Scrapbook. 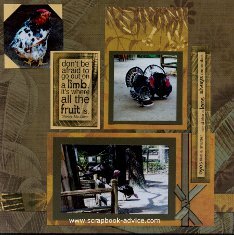 Again, all scrapbook items used here were from the Raku kit from ClubScrap.com. 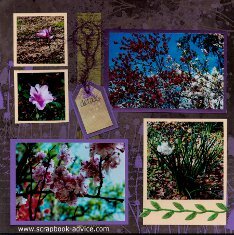 The Wildflower collection from ClubScrap.com fits these final photos for these pages from the Magnolia Plantation Scrapbook. 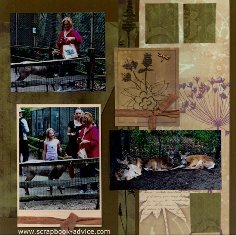 What I enjoyed about this Themed Scrapbook of the Magnolia Plantaton and Gardens was the fact that I mixed up where I got m y papers and embellishments from. 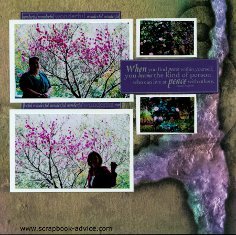 I tried to match the color in my photos to the colors of the papers which is what I stress in step 4 of the Quick Start Quide of Scrapbooking for Beginners. 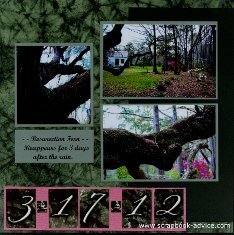 I have used stuff from my stash and papers from various distributors and I like the over all changes as I flip though my Magnolia Plantation Scrapbook.